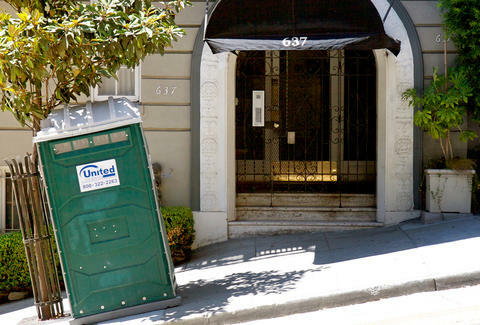 A San Francisco water utility manager is in hot water (or maybe...lukewarm water?) after he was seen peeing into a reservoir that supplies millions with drinking water in the San Francisco Bay Area. Public Utilities Commission employee Martin Sanchez, who reportedly makes over $100,000 a year, will likely face a week-long unpaid suspension for relieving himself in the Priest Reservoir last month, the Associated Press reported. The 674-million-gallon reservoir was emptied for maintenance at the time... but still. A spokesman for the San Francisco Public Utilities Commission said Sanchez was caught after "several (!) anonymous complaints," (exclamation point ours), though officials said public health was not at risk, according to the report. This isn't the first time someone's been "making water" in the water supply of a major West Coast city. A 19-year-old man was cited in April of last year for peeing into a 35-million-gallon water reservoir in Portland. City officials had planned to dump the water in the sewer system, but ultimately decided to use it for other purposes that would keep if from reaching peoples' taps, the AP reported. Don't try this at home, kids, or urine big trouble. Tony Merevick is Cities News Editor at Thrillist and is very appreciative of New York's amazing water supply. Follow him on Twitter @tonymerevick.